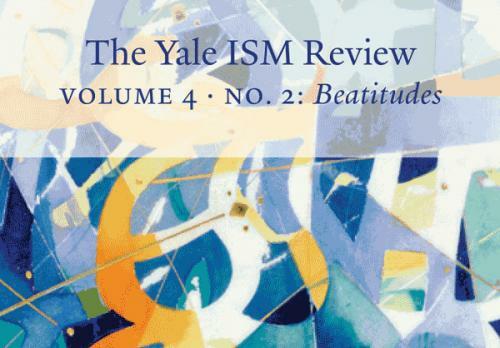 Home > News > The latest issue of The Yale ISM Review: "Beatitudes"
The latest issue of The Yale ISM Review: "Beatitudes"
We are excited to announce the publication of the latest issue of The Yale ISM Review. Volume 4, No. 2 centers on the theme of the Beatitudes. Beatitudes features articles and other works by Teresa Berger, Benjamin Bergey, Walter Burghardt, Herménégilde Chiasson, Cheryl Cornish, Cathy Hagstrom George, Peter Hawkins, Paul Inwood, Christopher Irvine, Swee Hong Lim, Thomas Long, Michelle Lewis, and Hyuk Seonwoo. Also featured is Thomas Ingmire’s exquisite illumination of the Beatitudes in The Saint John’s Bible, shown in detail on the cover.